Let’s talk Poutine! I first had poutine 6 years ago when my brother and I took a weekend trip to Ottowa, Canada. I had never even heard of poutine before then but when we crossed the border and saw all the amazing options we had to try them! While I’m not a huge gravy fan I love potatoes and I love cheese. I thought the poutine was delicious and couldn’t wait to have it again. Little did I know it would be 5 years later that poutine would show up in my life again. Last summer I was lucky enough to go to the Food and Wine Conference. While there they had an amazing poutine bar with multiple types of poutine put on by Idaho® Potato. My favorites were the chicken and waffles poutine and the short ribs poutine. I couldn’t say which was better but I loved them both. In fact, I was so impressed by the poutine that I put it on my 35 while 35 bucket list! Of course the fall becomes so busy for me because I start back to school and things get crazy. It’s not easy blogging part time when I’m working full time! 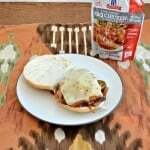 So just when I thought poutine might not happen along came a recipe contest from Sunday Supper Movement and Idaho® Potato. They are challenging everyone to make a creative poutine recipe. Not only was I excited because I was going to make poutine, I was even more excited because I can win a trip back to the Food and Wine Conference by making the poutine! In addition to winning a ticket to the Food and Wine Conference you can also win $500, $200, or $100. I don’t want to brag, but last year I won the Idaho Potato recipe contest with my Roasted Potatoes with Goat Cheese, Bacon, and a Balsamic Drizzle. That was a recipe that came out of the oven and I knew it was a winner. My husband and I were eating it cold out of the refrigerator it was so good. 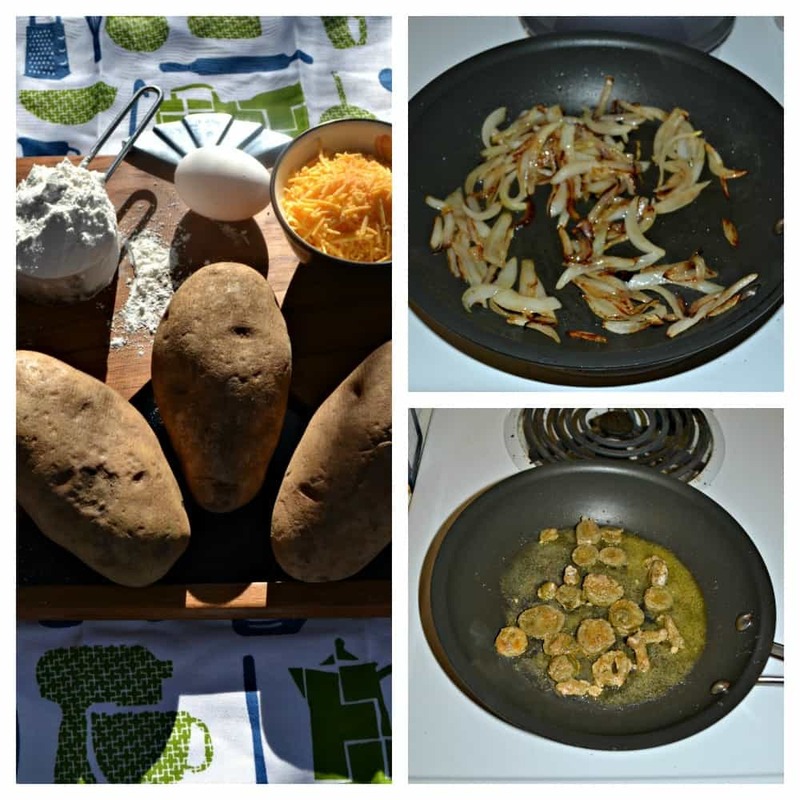 Since I won last year, I figure there’s a huge expectation on me to come up with another great Idaho Potato recipe. I won’t lie, I had a list of about 10 poutine ideas. As I went through them I ended up crossing all but 2 off my list. Both of the ones I left on the list are set on top of homemade pierogies. 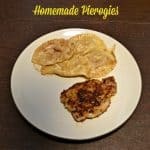 Why pierogies? Well, I’m from Pittsburgh of course! Pierogies are a big deal in Pittsburgh. People even dress up like pieorgies and race around at the Pittsburgh Pirates games. There are entire shops that just sell pierogies. 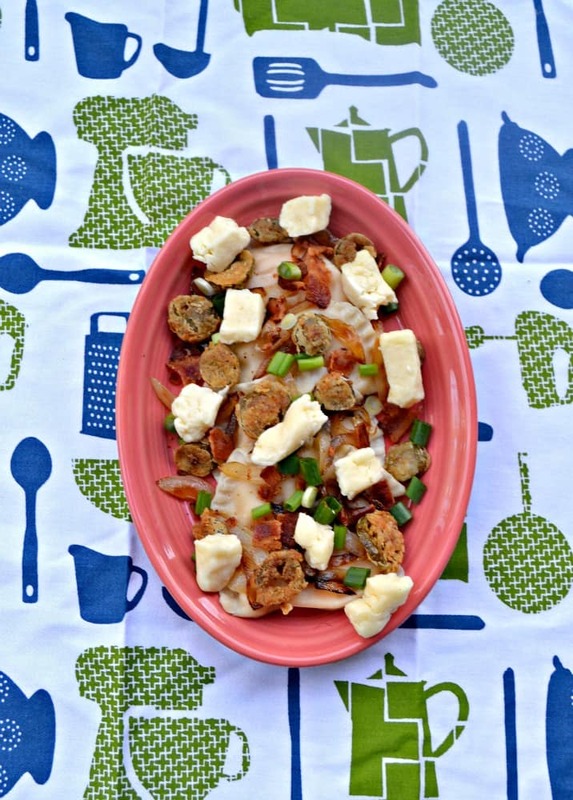 So when I thought about making a poutine that meant something to me, it made sense that I went with pierogi poutine. As a child my great Aunt Kaye would always make batches of homemade pierogies. Anytime we went to her house she’d take a batch out of the freezer for us to take home. I loved visiting her. Since her death, my dad has taken to making the homemade pierogies. His are just as good as my Aunt Kaye’s and he makes them for holidays. I look forward to Thanksgiving and Easter just to eat his delicious pierogies. Several years ago he came down to my house and taught me how to make them. While I can and do make my own pierogies, my dads are still the best. So for my poutine recipe I made a smaller batch of my homemade pierogies using Idaho Potatoes ,cheddar cheese, and onions. Pierogies take some time to make but the great thing about them is you can freeze them then take them out and use them as you need them. I like to make a few dozen at a time so we can have them for dinner several times. I made the pierogies the day before I made the actual poutine. I froze 3 dozen and put 1 dozen in the refrigerator to use for my poutine dish. I made the poutine by frying jalapenos battered in breadcrumbs. Oh man is this delicious! I ended up eating several of the jalapenos coming straight out of the pan. After making the jalapenos I fried up some crispy bacon and a small pan of caramelized onions. Once they were cooked it was as simple as plating the dish. To make the poutine I put 4 pierogies on each of 2 plates. Then I placed some of the caramelized onions on top of the pierogies then sprinkles them with the crispy bacon. 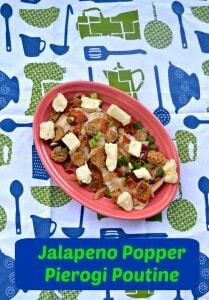 Next I put the fried jalapenos on the dish and then some white cheddar cheese curds. I finished it off with green onions. I took the first bite and **swoon**. I’m not kidding, this is like my perfect dish. Potatoes, pasta, cheese, and bacon all together in one tasty dish with a little bit of heat. It was amazing. I told my husband how awesome it was and as he took his first bite he made the face that says how much he loves it while giving me a thumbs up. It was so good we didn’t have to say anything. We simply enjoyed the dish. 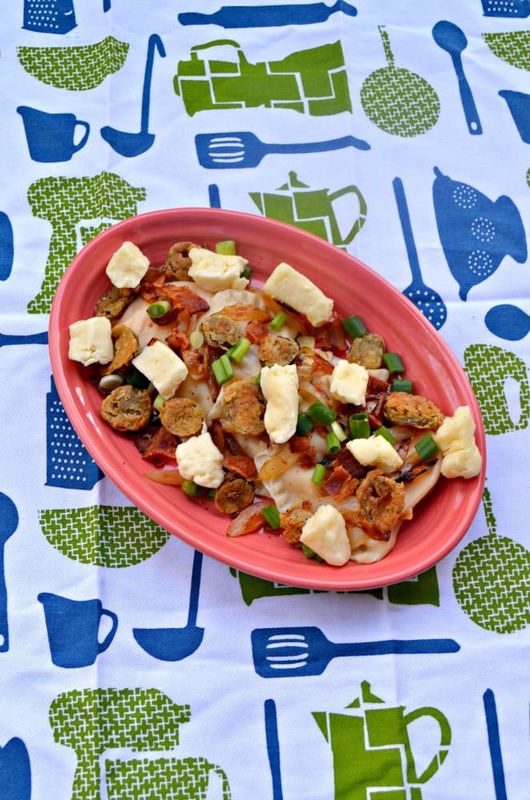 Make this delicious twist on poutine with Idaho Potato pierogies, fried jalapenos, crispy bacon, and white cheddar cheese curds. To make the fried jalapenos combine the flour, paprika, salt, and black pepper. 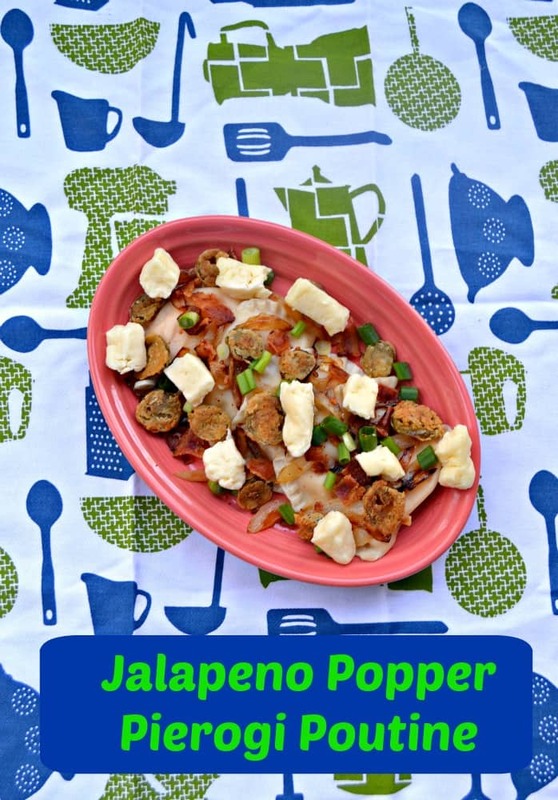 Place the sliced jalapenos in the flour mixture and toss to coat. Place 2 tablespoons of olive oil in a medium skillet and heat over medium high heat. Add the jalapenos and cook for 3-4 minutes per side or until browned. Once they have browned remove them to a paper towel lined plate to drain. Using the same skillet, add the onions and cook over medium heat for 5 minutes, stirring occasionally. Add in the sugar and stir well. Continue cooking over medium heat for 15 minutes, stirring occasionally, or until the onions have caramelized. Remove from heat. To make the poutine take 1 dozen pierogies from a freezer bag. Cook them in a pan of gently boiling water for 3-4 minutes. Drain. Lay 3 pierogies on each of 4 plates. 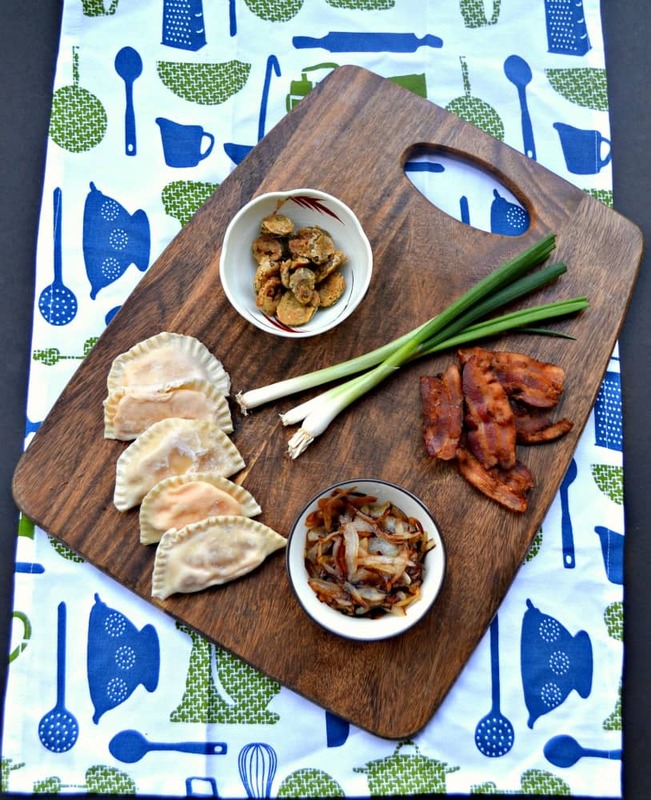 Divide the caramelized onions between the plates, putting them on top of the pierogies. Sprinkle each plate with the cooked bacon. 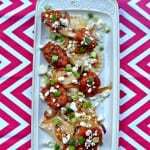 Then top the pierogies with the fried jalapenos, cheese curds, and finish them off with chopped green onions, serve immediately. 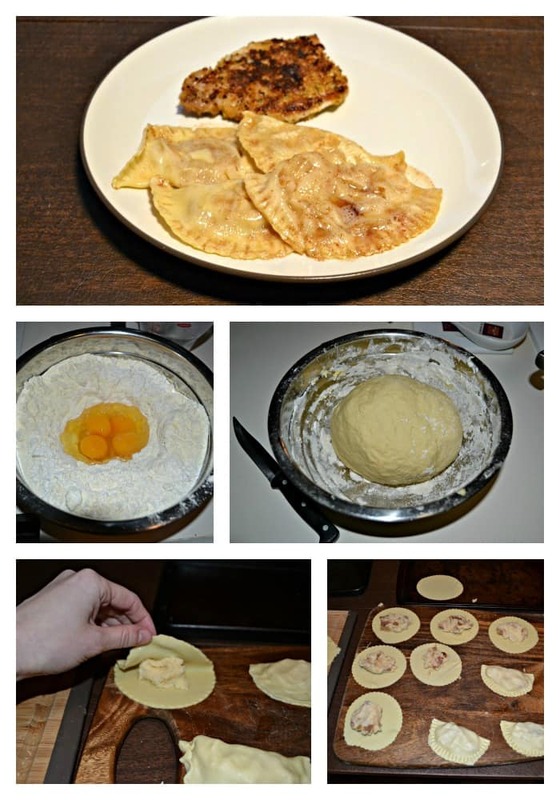 The pierogi recipe is my great aunt's and dad's recipe. The Poutine recipe is a Hezzi-D Original Recipe.